October 6—Hundreds of protestors rallied to support pro-refugee Mayor Domenico Lucano after he was placed under house arrest for allegedly arranging a “marriage of convenience” for a Nigerian refugee. Since 2004, under Lucano’s leadership, this small town has welcomed thousands of migrants and refugees. The town has created social programs and organized to create useful work to integrate the new arrivals into the society. Under capitalism, this has meant selling their labor and the products of their labor. In a communist society we will organize to find useful work for everyone—and nothing will be bought and sold. 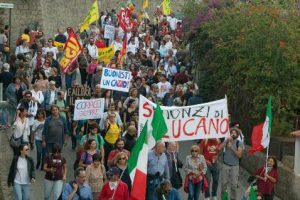 What’s gone on in Riace directly contradicts the policy of Italy’s neo-fascist Interior Minister Salvini who, the previous week, announced anti-immigrant measures including cutting funds for migrant reception and integration. 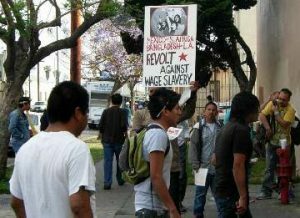 Throughout Europe, the masses are increasingly polarized: while masses of working people, unions and community groups welcome immigrants, there is also a growing fascist movement which seeks to mobilize workers in a racist movement to attack immigrants. The growth of fascism is a result of capitalism in crisis. Italy and the rest of Europe has seen this before. Red Flag readers must take communist ideas to the masses who rallied to support Lucano and to welcome immigrants. 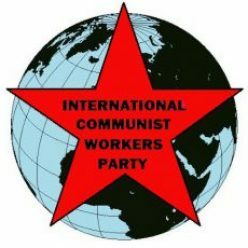 This time, the fight against fascism must lead to mobilizing the masses for communism, to fight for a world without bosses, and without borders.